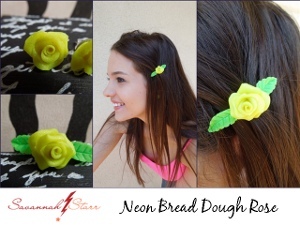 When you make bread dough, you can turn it into just about anything, including these trendy Awesome Neon Rose Earrings. In this video from Savannah Starr, learn a simple bread dough recipe and then make earrings, a hair pin, or other jewelry to wear this season. Remove crust from one slice of bread. Tear bread into pieces into plastic cup. Add one tablespoon of Aleene’s Original Tacky glue to cup along with a dab of cold cream. Mix all ingredients together in cup with craft stick until dough starts to form a ball. Add a dab of cold cream to your hands and scoop out the dough mixture. Knead for several minutes. When the dough is ready, all of the color should be mixed and the dough should be smooth. Place dough into a zip top bag to protect it from the air. Tear off a small piece of dough the size of a large pea (and return the rest of the dough to the bag). Press the ball into a flat circle. The dough should be very thin. To form the flower center, begin rolling from one side. When the flower center is rolled, use your finger tip to gently roll back the edge to give shape to the center. Prepare next petal in same manner as flower center and press in place around center. Continue to add flower petals until you have created flower of desired size. Hint: be sure to keep each petal in line at top with the flower center. This will give you a nice, open flower. If you keep placing the petals too low, it can look like a pinecone. If you place them too high, you create a closed bud.) Use fingertip to gently roll the petal edges down to give shape to your rose. Let rose air dry overnight. Glue on to earring findings. Let it dry overnight.